Margaret Atwood and The Secret Loves Of Geek Girls: A new comics anthology for lady geeks. Margaret Atwood, pictured in Hong Kong in 2009, is contributing to a comics anthology about lady geeks. Drop what you are doing, female geeks and the men who love them: Margaret Atwood is contributing to a comic book anthology about the love lives of your misunderstood tribe. This is not a drill. The book is called The Secret Loves of Geek Girls, which is being put together by comics editor Hope Nicholson. Nicholson started fundraising for the book on Kickstarter this week, and she’s nearly reached her $30,000 goal with a hefty 29 days left to go. “I find myself very optimistic whenever I see an article on advice or information on geeks and dating,” Nicholson explains in her fundraising appeal. “But soon this excitement turns to disappointment; the articles are almost always written with only the male geeks in mind.” This book intends to fill that gap with stories about female geeks dealing with “relationships and crushes, rejections, unwanted advances, and general romantic and sexual entanglements.” And it’s told in the geekiest form possible: the comic book. Atwood is up there with Stanley Kubrick as a figure who’s helped elevate the literary and artistic status of science fiction, showing mainstream audiences that truly great art can come out of this genre. Her most famous book is, of course, a sci-fi novel, the dystopian classic The Handmaid’s Tale. 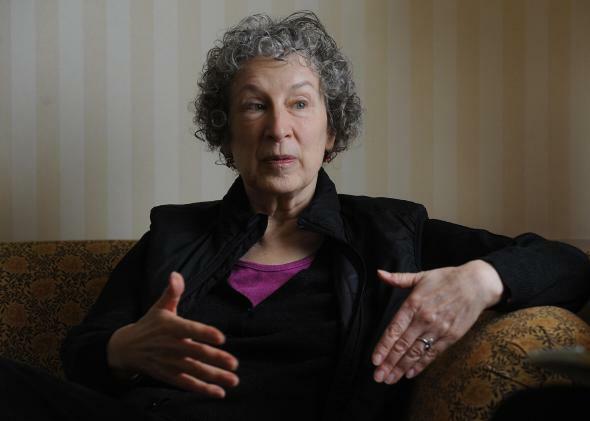 But sci-fi and fantasy, as genres, leave their fingerprints all over Atwood’s work, from the sci-fi novel-within-a-novel of The Blind Assassin to her recently completed Oryx and Crake trilogy of speculative fiction. “I’m white-hair w. cat; pleased I have long legs at last!,” Atwood jokingly tweeted about her promotional image for the book. Having a white-haired lady in the mix is a great thing for us all. Female geekdom is on the rise in recent years, which is partly why you’re seeing such ugly backlashes against it. But it’s important to be reminded that it’s not a new phenomenon. There are plenty of OGs of female geekdom running around such as Atwood and Elena Kagan, who outed herself as a comics nerd this week with a multitude of goofy Spider-Man jokes in her opinion in Kimble v. Marvel. Our people have always been around, lady geeks. Don’t let anyone say that you’re late arrivals to the party.